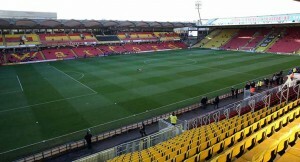 Swans fans are in the Vicarage Road Stand behind the goal. There shouldn’t be any hassle with the locals; although there can be a heavy police presence around the ground and the town centre. Food available in the ground includes pies, pasties, sausage rolls, and hot dogs. There is plenty of leg room and normally a great atmosphere. Unfortunately, the concourses are very small and can get easily crowded. There’s a bookies in the concourse for those who fancy a flutter. For those fans with visual problems up to three headsets are available. Not the most awe-inspiring place to stop the night, but if you fancy it, it has plenty of ethnic restaurants, loads of pubs, a museum, art galleries and gardens and parks. The biggest tourist attraction nearby is the Warner Brothers Studio tour, which is one of the places the Harry Potter films were filmed. There are a number of chain hotels in or near Watford, including Hilton, Mercure, Holiday Inn Express and Jurys Inn. The Pump House Theatre & Arts Centre (WD17 2JP) is closed over the Christmas period. There’s a New Year’s Eve Ball at Watford Colosseum (WD17 3JN), tickets are £59 and includes a three course meal and a welcome drink. The ‘Oddfellows’ (WD18 0RD) is a 5 minute walk from the ground and has a BBQ in the beer garden. Most fans head for the Wetherspoons pub ‘Moon under Water’ (WD17 2BS) on the High Street, 10 minutes away. On the High Street street, you’ll also find Walkabout, Revolution, The One Crown, Bar Bordega, The One Bell, The Reflex, Baraka and Kandi Klub. Please note that alcohol is not sold in the stadium. There are match day car parks at some industrial units near the ground, as well as the Vicarage Road Girls School (WD18 0AE), near the stadium at £10. The ground is near the town centre, with a number of car parks in walking distance. The Church multi storey car park (WD18 0JD), it’s £1 per hour on the inner ring road, but can be busy to get out of after the game. The Harlequin multi-storey (WD17 2UB), costs the same but easier to get out after the game. The Gade multi storey car park (WD18 0JX) costs the same and a 20 minute walk from Vicarage Road; far enough away to get away easily. Watford High Street station is a 10 minute walk, but most trains come into Watford Junction, a 20 minute walk. Either get a train to Watford High Street or leave the station & take main road straight opposite (Clarendon Road) all the way (over Ring Road at lights) up to the High Street. Turn left and go past the Moon under Water then take the first right after 100 yards into Market Street. Continue along again crossing Ring Road to T junction & then left at ‘Ebb-Tide’, (WD18 0PT) a recommended chip shop. Vicarage Road is the next right turn. Watford has a tube station, (Metropolitan Line), under a mile from Vicarage Road, but trains from London are normally quicker. Trains from Swansea to Watford High Street leave at 07:29, 08:29, and 09:29, for the journey 4.5 hours. Trains back are at 17:24 and 18:24 and 19:24 getting in at 21:43, 22:44 and 00:03. Tube travel is needed between Paddington and Queens Park and vice versa. Any idea of post code for girls school parking please? Hi – yes it’s WD18 0AE and I’ve now added it to the article as well.